Biography: Cameroon House Church Planting Network began in 2008 with the mission to convert every beer-drinking house to a house church, spreading the Gospel on a one-by-one basis and networking with other house churches. Cameroon has a high ratio of alcoholic heads of households. This ministry intends to help establish a local church at distance of every five square miles. This would help resolve a long-standing problem of people having to travel long distances just to attend church services. The goal is to plant five house churches each year, taking 49 years to complete their project. After living in Nigeria for 32 years, they moved to Cameroon to follow their vision. Being self-supporting is an important part of their success. Poupo tells us, "people really understand that the house church concept, or cell, has been sustained since the days of the early or primitive church." Poupo has a desire to duplicate himself, men of peace following God and spreading the Gospel. Strengths: Poupo moves in the five-fold ministry gifts and is a strong teacher. Felicia is a strong woman who works with her husband to meet their ministry goals. 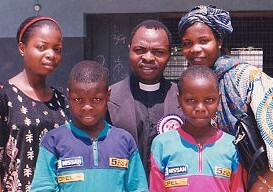 Family: Poupo and Felicia have three grown children, Esther, Philemon and Emmanuel.